Emma was very funny during our visit. Wherever Gabby was Emma was no further than one step behind. If the baby was crying she was stuffing her pacifier in her mouth trying to calm her. If she seemed bored in the swing Emma was giving Gabby her toy and adding more if Gabby still fussed. If Gabby had a dirty diaper, Emma was there to supervise that it was changed correctly. If Gabby was changing clothes Emma was there to assist with the buttons. If Gabby wore pig tales, by George, Emma was going to have pig tails too. They were inseperable during our visit which had its benifits and downfalls because when Gabby was hungry Emma wanted to help feed her. Since I am nursing Gabby I would go into the room to feed her. I would tell Gabby that it was time for Gabby to eat so she needed to go see mommy and leave the door closed. Emma said okay and walked out. About thirty seconds later Emma walked in the room and was perplexed. She asked me where the bottle was. I told her that Gabby didn't eat from bottles that she was breastfed. Of course, curious as she is, Emma asked what breast feeding was. I told her to go ask her mommy. After about the third time I fed Gabby, Grandma gave Emma a simple explanation of what it was and there were no more questions. 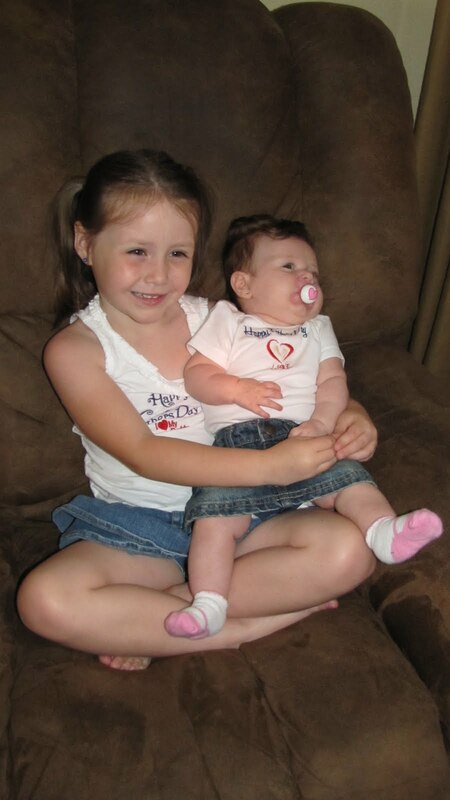 It was precious how much Emma adores Gabby. I am so excited they will get to see each other again in three weeks! Maybe we will even have a glimps of baby bump Silva!